Big news! We have just released our 2018 Election Action Plan and we have only 18 days left to see it through! This summer, Doug Ford, threw our local elections into chaos and did his best to stop incredible progressive candidates across Toronto from getting elected. With your help, we fought back and mobilized tens of thousands of people across Toronto. Now, it's up to all of us to win at the ballot box on October 22. That's why we're working to elect a progressive council and school board that will stand up to Ford and fight for a city that works for everyone. The last few weeks we've been busy surveying candidates and reviewing the voting and attendance records of current councillors running for re-election. Then we took a deep look at ward races and candidates across the city while reflecting on our strengths and what we have to offer. Now we have just 18 days to get to work in 14 target wards across the city. This includes working to unseat 5 of city council’s worst councillors, including of course Giorgio Mammoliti! 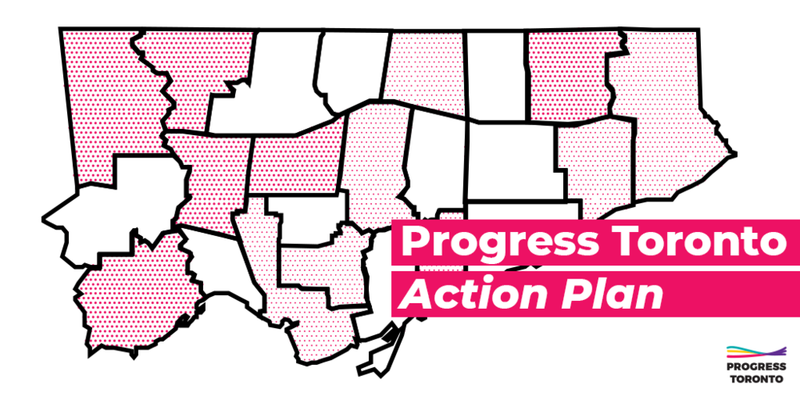 Check out our full election action plan to see the wards we are working in and how we will win. See our full election action plan here. Supporting progressive candidates in key wards and working to unseat our worst councillors is happening in different ways and the tools we are deploying depend on the race. We've already been hard at work. Over the last week, our volunteers have delivered almost 5,000 flyers about Mark Grimes' record to households in swing polls in Etobicoke Lakeshore. And volunteers have phoned over 2,000 people to tell them why Amber Morley is the best candidate for South Etobicoke and to get her supporters ready to vote Morley on October 22. We hope you get a chance to check our our election action plan! Thank you from all of us at Progress Toronto!